Obama also knows that the Presidency in Israel is largely ceremonial. Privately US administration officials were more critical, claiming that Secretary of State John Kerry saw no answers to the issue of peace and that the US would find it harder to keep Israel from being isolated. At a recent Saban Forum at Brookings, Kerry had also had dire warning for Israel, claiming the country was walking towards a one-state solution. This has been the Obama administration’s message for years now. They have tried to tell Israelis and American Jewish supporters that they have Israel’s best interests at heart. At the moment this is happening the Joint List leader Ayman Odeh has been on a tour of the US. When Odeh was chosen to head the Joint List it was an unexpected choice. Never having been an MK he was asked to head a fragmented group of mostly Arab political parties that spanned the political spectrum from the Islamic right to the communist left, from Arab nationalism to coexistence. Privately many of those who voted for the Joint List in january admitted, this was a strategic partnership born of Israel raising the electoral threshold, some estimated the partnership would fall apart within months of joining the Knesset. But the List has remained together, with as much staying power as Israel’s fractious coalition seems to have. Odeh got some press when he was chosen as a leader. He wrote an oped for ‘The Guardian’. He was seen as youthful (40 years old), intellectual, and, as one Jewish writer claimed, he had “what looks exactly like an average Israeli Jewish family.” Those closest to him re-iterated that this man could be a transformative figure. They called him “our Martin Luther King.” Whether this MLK narrative was thought up by those around him or by Odeh himself, it has been a constant theme of his campaign and his speeches. When he first spoke to the Knesset he stressed this “I have a dream” vision for a country in which Palestinian Arabs were more equal citizens, and “integrated” into sectors of the economy and racism was reduced. Nice ideas, although Israeli society constantly appears to be more racist and divided year by year; hatred of Arabs has more normalcy in normative politics, and even on the Jewish “left” there is open discussion that Arabs pose a “demographic” threat to the state. Rather than large numbers wanting Arabs integrated into the elite work force or ending segregation, many voters claim they think Arabs should be barred from voting. Odeh’s message of integration is in contrast to some of the voices from the Arab community in Israel that has tended to have combative views towards the state of Israel, often speaking more about the Palestinian struggle in the West Bank and Gaza, and running afoul of Israel’s media, portrayed as traitors and pariahs. But on the eve of the 2015 elections even Haneen Zoabi was toned down in her critique, and embrace of coexistence. She went to the Alternative Information Center in Jerusalem and tried to encourage veteran Jewish leftists that they could vote for a party that wasn’t their normal Hadash constituency. Many of these radical lefties might have been post-Zionists or anti-Zionists, but Zuabi or others didn’t appeal to them. In the midst of speaking to the media about his MLK-like qualities, Odeh did something unusual, he went out and actually did something that was MLK-like. Before being sworn in to the Knesset Odeh embarked on a “long march” for Bedouin rights, from the Negev to the Knesset. I covered the march in two pieces for The Jerusalem Post. It was a fascinating experience. 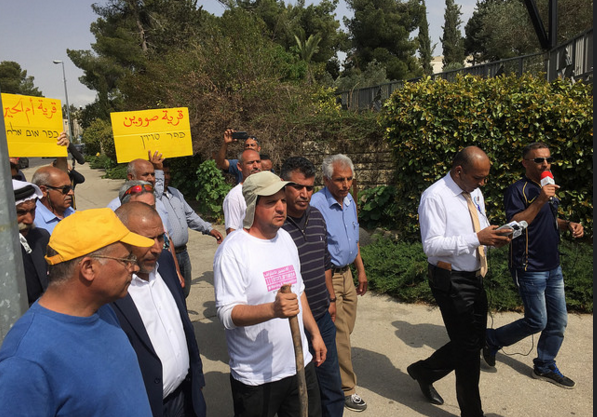 The core group of 100 or so marchers were mostly from the Hadash part of the List, but there were others who came, such as Bedouin activists and also Balad supporters. When the ‘long march’ was over, it had little impact. Balad supporters I spoke with said they felt this wouldn’t work. Odeh talked about doing another march from the Galilee. But he was tired after having walked 130 kilometers in three days. Despite the rousing songs and food at Abu Ghosh on the second night, it was clear, the other members of this list were not into a long civil rights struggle. There would be no more marches. The Joint List has been ignored by Israel’s political system. Netanyahu and Opposition leader Isaac Herzog talk more about whose Zionism is the real Zionism than about any issues of minority rights. Herzog constantly reminds the public that if he were Prime Minister he would be tougher on security and that he wants to preserve a Zionist and Jewish state. This has little to do with the List’s struggles. They also recall that Zionist Camp tried to ban Zoabi from running. It’s hard to want to ban political parties from running and then work with them. In general this is part of the divide between the Zionist “left” and the parties Odeh represents. When Odeh speak at a Peace Now conference he claimed it was traditionally the Left that suppressed Arabs in Israel. Jamal Zahalkha famously called out Stav Shaffir and left wing Jewish members of the Knesset in a speech on this topic in September. After all, who created the acceptance committees and built kibbutzim atop Palestinian villages in the 1950s? So Odeh’s parliamentarians have worked to reach out to international supporters. Even that has not gone well. A meeting in July with EU parliamentarians was blocked because the List members Jabareen and Touma-Sliman didn’t want a Knesset “diplomatic advisor” to be present. Odeh was excluded by Netanyahu from a briefing to opposition leaders. When he did speak, his passion seemed lost on the audience. When Odeh’s trip was announced +972 termed it “Mr. Odeh goes to Washington.” The site noted, “a diplomatic visit that will include a stop at the Haaretz conference in New York; public speaking events; and meetings with members of Congress, representatives of the State Department and the White House, Palestinian and Jewish activists, civil rights leaders, and more.” The author noted it also comes on the heels of the banning of the Islamic Movement’s northern branch in Israel. Bloomberg News saw the Odeh visit around his narrative of civil rights and MLK. 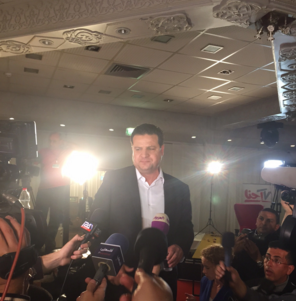 “Odeh presents himself as a new brand of Arab-Israeli politician, seeking to build equality rather than denigrate Israel.” Odeh has been hammering home these points, “There is no democracy with discrimination and those who want Israel to be a true democracy have to work for equality for the Arab minority in Israel,” he noted to reporters. Stepping into the US is stepping into a minefield. This is not only because the US is in the midst of a an election season that pits Donald Trump’s bombastic, some call it fascistic, statements against other mainstream Republicans; but also pits Hilary Clinton against an avowed avuncular “socialist”, Bernie Sanders. Odeh comes to an America that is the most pro-Israel country in the world, in contrast to Europe where critique of Israel is more strong. He also comes to an America in which even those who critique Israel often want to “do what is best for it,” rather than radically re-make it. Many of the “progressive” Jewish voices in the US, for instance, support an Ari Shavit style Israel. This is not an Israel that includes those like Ayman Odeh. This is an Israel that is Jewish-first, that wants acceptance commitees and segregation and wants to model itself on European nationalism of the 1950s. How to speak to a Jewish audience that wants to be rid of Palestinians to “save” Israel, to make it “truly Jewish”, where people talk down to those like Odeh in an Orientalist manner and claim his family “looks like a Jewish family”? He met members of the Reform movement tuesday. “MK Odeh has an inspiring vision for a brighter future for Israelis and Palestinians,” Rabbi Rick Jacobs said. The Jewish Week is one of the few newspapers to have covered this visit well. At a meeting with the New York Times he tried to get across his support for peace and coexistence. “We are living proof that Arabs and Jews can refuse to be enemies,” he told the reporter. This was an important meeting, but it was also limited in its coverage, so far. On December 11 news broke that Odeh had refused to meet Malcolm Honlein at the Conference of Presidents of Major Jewish Organizations because the Jewish Agency was had offices in the same place. “I came here to represent the Arab public in Israel to American audiences,” Odeh said in a statement. Why did Odeh decide he couldn’t meet Honlein at the latter’s office? He wanted a change of venue. “I cannot in good conscience participate in meetings in the offices of organizations whose work displaces Arab citizens, just as in the Knesset, we do not participate in the Ministry of Defense, the Foreign Ministry,” he said in a statement, which referred to JNF (which in a convoluted way is related to the Jewish Agency in his view). Now this story will be covered in Israeli circles, but the rest of the trip ignored. Jewish Agency Chairman Natan Sharansky has already accused the List leader of trying to score “cheap” political points rather than “advance” his community. This is the general narrative of Israeli commentators and politicians: Arab MKs don’t care about their community, they only care about the Palestinian issue and don’t work for their people. Odeh had run afoul of this narrative in November when riots broke out in Nazareth and the mayor of Nazareth, who is also Arab, accosted Odeh on the street during a live interview and accused him of stirring up trouble and ruining “coexistence.” Suddenly Ali Salam was the hero of Israeli media, he “really” works for his community rather than the politicians. But in October when a woman was shot in Afula, accused of being a terrorist, Salam had not been as respected when he said she was likely mentally ill, not a terrorist. The Odeh visit thus reveals how circumscribed is the role of even the leader of most of the Arab minority in Israel. He isn’t the opposition leader, so he isn’t accorded that respect abroad. In Israel the Jewish political parties from the left to right can ignore him and everyone in the larger community, because that is the accepted method of politics in Israel. The media can rest on the pillow of “Arab MKs don’t care about their voters or represent them.” Who “really” represents them? A few Arab voices who are avidly pro-Israel and who are trotted out at every opportunity to show there is “coexistence” and Israel is “better than other countries in the region” for Arabs. For many Israelis, including politicians and media, there is no possibility ever to be a legitimate voice for Arabs in Israel. The vast majority of the Arab minority identifies as Palestinians. But they cannot be “Palestinian” in the media or text books. That threatens Israel, to admit that Palestinians in Gaza, the West Bank, Nazareth and Rahat identify as the same community. Those like Haneen Zoabi are a constant lightning rod for “gotcha” politics, silenced officially in the last Knesset, she is constantly on the brink of being charged for “incitement” for saying the same thing Jews on the left say. When she said that Palestinians who kidnapped Jewish teenagers in the West Bank were not terrorists she was almost charged for making a statement that even Israel Prize winners have made, that many Israelis have made in the media. Zoabi has even become a slander for all Arabs, “we don’t want more Zoabiz” in the Knesset, has said Yair Lapid and others, referring to all Arabs as ‘Zoabiz’. In general Israel does not accept Arab voices. TV presenter Lucy Aharish has been bashed constantly on the left as a “token” who doesn’t “speak like an Arab” or “dress like an Arab.” No one in Israel raises a hand and asks how a major newspaper can claim what an Arab “dresses like.” Only in a hijab? There is no way for an MK to discuss such basic issues as discrimination in housing, land rights, planning or anything. Everything to do with the Arab community is shunted aside, ignored or seen as 5th column traitorism. Basic things like street signs, mail delivery, public bus service, police response and investigation, are lacking. Tens of thousands live in “unrecognized” communities, and probably many hundreds of thousands in houses that are built without permits. Numerous Arab communities are bankrupt and run by Jewish mayors sent by the state. Even those communities that serve in the army, such as the Druze, complain of basic discrimination in housing and land. What is Odeh to do abroad? Since he isn’t greeted as an opposition leader, and he is not a representative of the “Palestinian issue”, which means the PLO, PA or elements of Fatah or Hamas, he is left in a small area to operate. He is left asking Jewish groups for legitimacy. It’s like having a member of the Serb minority in Kosovo come to the US to beg Albanian-Americans to encourage Albania to respect Serb rights. What role, really, can these progressive Jewish organizations have on Israel, when they have been talking about having a more “American” style equality in Israel since the time before the state. In general the dialogue in these “liberal Zionist” circles is towards having Israel “fulfill it’s Jewish values,” in which the Palestinians become merely a tool for Jewish activists to make themselves look good. Is civil rights an end goal, or merely a means towards being a “light unto the nations”? As the +972 article noted, among pro-Palestinian voices Odeh is almost seen as a “collaborator” with Zionism for his views on integration and for sitting in the Knesset. So he’s not “radical” enough for the BDS crowd and the Palestinian supporters in the US who find even the PA to be an “Israeli-Zionist” plot. It would have been good for Odeh to meet with US Congressman and show them the face of Palestinians in Israel, especially at a time when Muslim Arabs are increasingly stereotyped in some sectors. In the end a meeting with Obama wouldn’t matter. Obama has been lecturing Israel for years about it’s policies. Obama himself has embraced the liberal Zionist narrative of doing what is “right for Israel.” Palestinians are not Obama’s main interest. He wants to save Israel. He comes from a progressive Jewish viewpoint, one that embodies those around him, because Obama is essentially a Jewish president, in a sense, a progressive Jewish one. His view of Israel is mirrored in that legacy. The Palestinian struggle or the rights of Palestinian Arabs in Israel, is not really a priority. Since Odeh plays little to no part in the “peace process,” he has no real use to the US administration. Nevertheless this was an important visit. Has he been able to inspire and spread his message? That will be the question. But it is good for MKs from the minority parties to present themselves to the American public. Often they operate only in a tiny bubble in Israel. If they are heard of at all outside of Israel, it is often for some controversial thing they did, like when Zoabi spoke in Europe and compared present day Israel to Germany in the 1930s. Odeh has broken new ground, but he walks on egg shells and every meeting is scrutinized for some comment that can make him seem “extreme” and “not working for his community.” Ironically, those Israelis who claim he doesn’t work to “advance” his voters, have done virtually nothing to “advance” the same community, which is viewed at the very least as a burden or unwelcome guests in the state. Israel has done little in decades for Palestinian Arab citizens. A vicious circle of alienation and pariah status has erupted. Some voters who went for the Joint List said openly this was the last chance they would give Israel’s democratic process. Odeh went to America with an MLK narrative. But the fact is that Israel is not ready for an MLK. It can’t even decide what to do with, or take responsibility, for its decades of military rule in the West Bank and its endless blockade of Gaza.